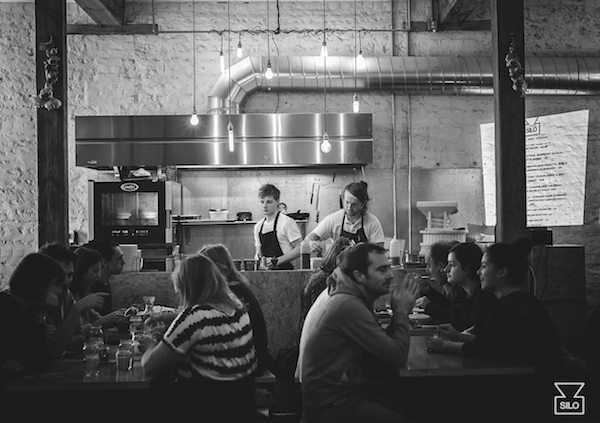 The restaurant, bakery and coffee house Silo is now most of the way through its first year and business is brisk. 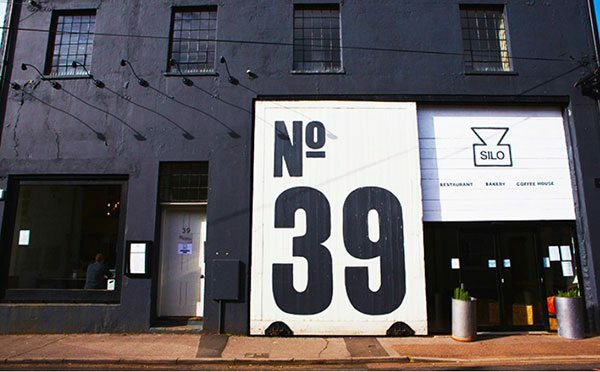 As the UK’s first zero-waste restaurant, Silo’s opening last October was so exciting even the national press got on board, with articles appearing in The Independent and The Guardian. We also ran a review here on RB back in November just a month or so after Silo hit town – the news was good, although it was still early days. 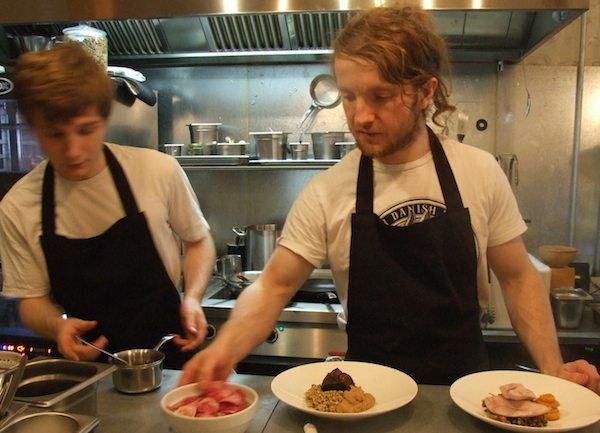 Most of the coverage focused on Head Chef and Founder Douglas McMaster’s green ethos and vision. 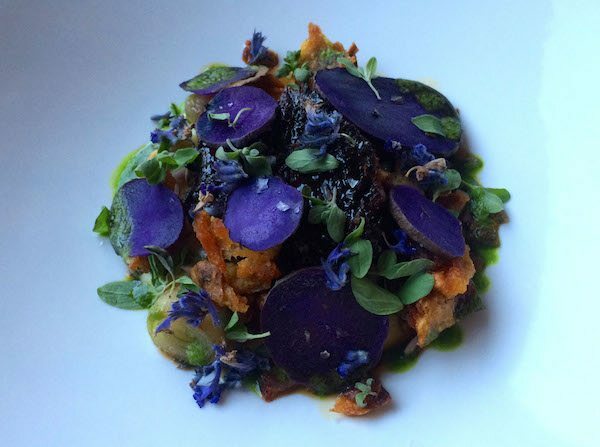 But now that Douglas has calmly and confidently steered Silo through most of its first year – often the trickiest time for a restaurant – it’s his innovative, exemplary cooking skills that are garnering the acclaim and repeat custom. Douglas has proven, day in day out, that he’s got the care and dedication needed to turn an inspirational philosophy into reality. His commitment to zero waste is admirable – one that should be taken up far and wide by restaurants and businesses of all varieties. Yet to Douglas his policies around recycling, re-using and composting are just parts in a much bigger puzzle that’s about working synergistically with one’s community and environment – a puzzle he seems to greatly enjoy piecing together and being part of. No nasty detergents are used in the restaurant at all, for instance. Instead, ordinary water is electrolysed and oxidised and turned into what Douglas calls “Jesus water”; a natural non-toxic anti-bacterial disinfectant more effective than soap and bleach. How brilliant is that? Douglas is equally as purist in his approach to suppliers as he is with his detergents and food choices – he works directly with local suppliers but only those willing to operate ‘packaging free’. In short, the zero waste ethos is woven into every single decision he makes, large or small, and Douglas seems to relish that process immensely. It’s clearly all a creative challenge he can get his teeth into. Now that summer’s upon us there’s an abundant array of seasonal ingredients that he and his team of chefs can play around with, so the latest menus feature delights such as asparagus, lovage, elderflower and “intercepted lemons,” which have been rescued before they get to landfill. 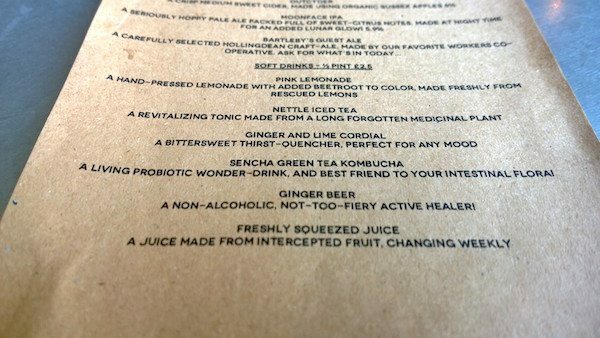 All of those words fill my heart with great joy as my friend and I scan the menus. To help our decision process, we sipped two of Silo’s house cocktails – both fruity and fresh little numbers containing Blackdown gin, lavender and mint in one, pink lemonade and mint in another. With two menus from which to choose it was hot work, so the drinks were refreshing and much needed. There’s the constantly changing a la carte evening menu, as well as a tasting menu for £30, which buys you four courses plus a ‘snack’ to start off with. The main menu dishes sounded tempting, with simple starters such as jersey royals with wild garlic butter; cauliflower soup with wild garlic and Sussex blue cheese and heirloom tomatoes with lovage and smoked quinoa. 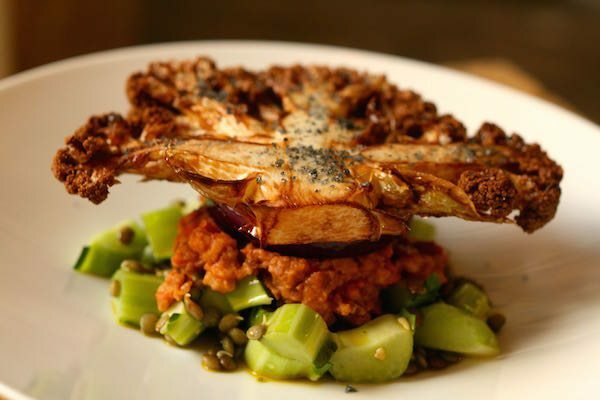 Main meals included a cauliflower steak with sprouted lentils and caramelised red onion, as well as an appealing rare breed pork belly with celeriac and smoked radicchio. In the end we went for the tasting menu to get a proper overview of Douglas’s cooking and scope. To drink, I chose a glass of the crisp and zesty Albourne Estate Bacchus white wine, while my friend went for the dry and melony Stopham Pinot Blanc. After a brief wait Douglas brought us some homemade sourdough bread, made with two varieties of wheat in a 60/40 ratio that they’d milled into flour in-house. The plan is to start selling their flour to other outlets. The combination of the single grain Einkorn, the oldest wheat known to man, and mulika created a hearty and distinctive flavour – light years better than any bread you’ll find on the high street. 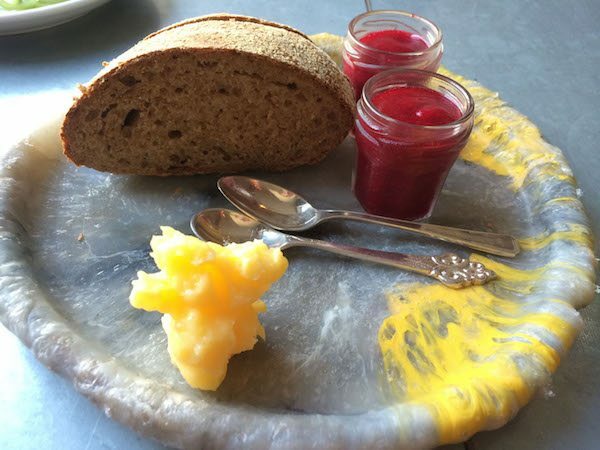 Alongside the bread was some smooth and creamy home-churned butter, as well as a small jar of chilled vivid pink soup made from beetroot, red onion and nettle juice. It was an enticing mix – sweet at first followed by an earthiness from the onion and then an exciting tang from the nettles. A lovely amuse bouche on a warm evening; fresh and interesting. 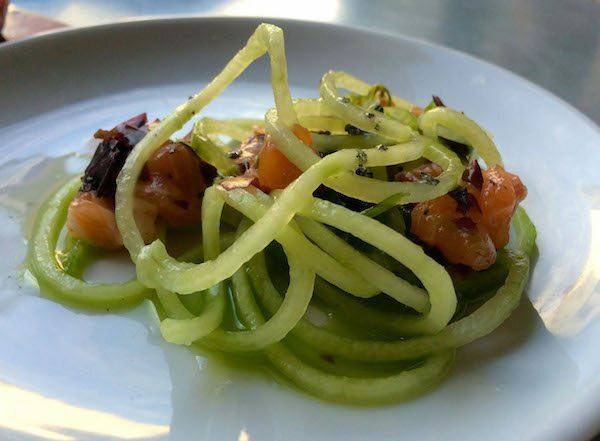 Next up came a dainty little serving of long thin strands of cucumber “noodles” with flakes of rich wild seat trout, seaweed and an elderflower dressing. In other words, summer on a plate – light, delicious and gentle. 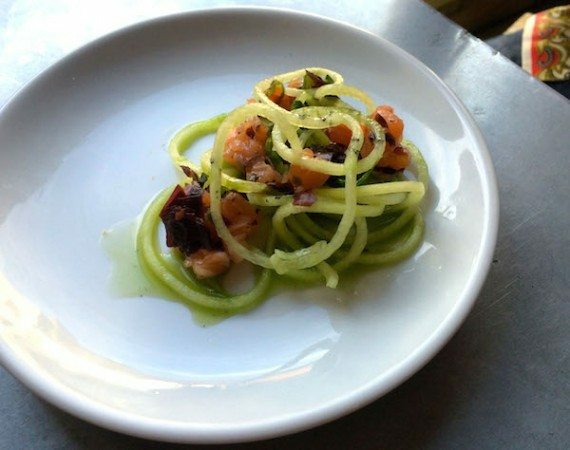 A delicate dish containing subtle flavours that were each given sufficient space to shine. By this time, my friend and I were thoroughly enjoying ourselves and very impressed with what we’d had so far. As a passionate mushroom lover, I was thrilled to give our next dish a try: an espresso mushroom broth with broad beans and wild herbs, according to the menu. 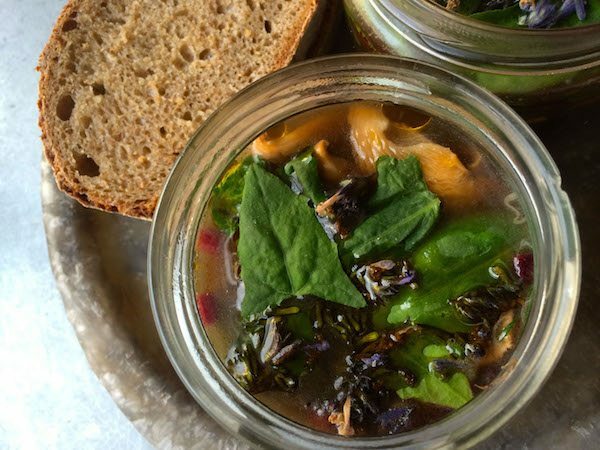 Served in recycled jars, which I rather liked, the steaming broth had been made from dried mushrooms from the espresso mushroom company that gave it a deeply satisfying savoury taste. Added to that were a panopoly of other earthly treasures, such as violet potatoes, radishes and pink oyster mushrooms. No wonder it’s one of the most talked about dishes on the menu. Our next course was a different experience entirely – bright green fresh asparagus sourced from a supplier to which Douglas provides compost – with toasted seeds and a solitary egg yoke slow-cooked at 64 degrees. 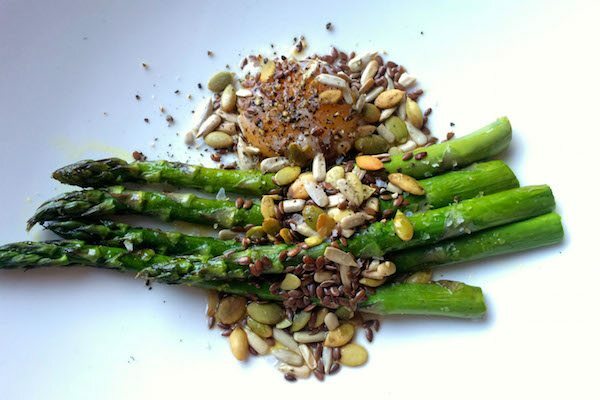 What was wonderful about this dish was how the yoke and seeds worked so well together, adding a creaminess, saltiness and texture which enhanced the fresh crunch and flavour of the asparagus. Very good indeed. At this point, my friend and I wondered where else Douglas could take us and we discussed the next round with anticipation. The menu simply stated ‘featherblade of beef with baked violet potato” which didn’t prepare us in the least for what we received. A featherblade is a cut from the side of the shoulder that takes its name from how it looks when sliced: like a feather with the nerve acting as the quill. For this dish Douglas had created a mound of deeply rich meat so perfectly cooked and soft it fell apart at the touch of our forks, accompanied by slow cooked shallots and topped with slices of potatoes of such a striking violet colour one could be forgiven for initially mistaking the entire dish on sight for a dessert. It was such a pretty dish in appearance – very feminine with a scattering of oregano flowers – yet the flavours weren’t shy or coy in any way, rather robust, deep and complex. The potatoes in the dish been used in a few different ways in the dish, for variety. At the bottom was pomme mousseline (a very smooth and creamy mashed potato) and on the top was a far crunchier potato, a bit like a crumble. At the risk of sounding repetitive with my praise, my friend and I thought the whole thing was really delicious and unusual… tasty, interesting, rich and indulgent… a luxurious, special plate of food. With our main courses over we reflected on the range of experiences we’d enjoyed in just a few dishes. Douglas has been quoted as saying that he thinks the food industry is “traumatized” through inhumane conditions, over-processing and excessive waste etc. 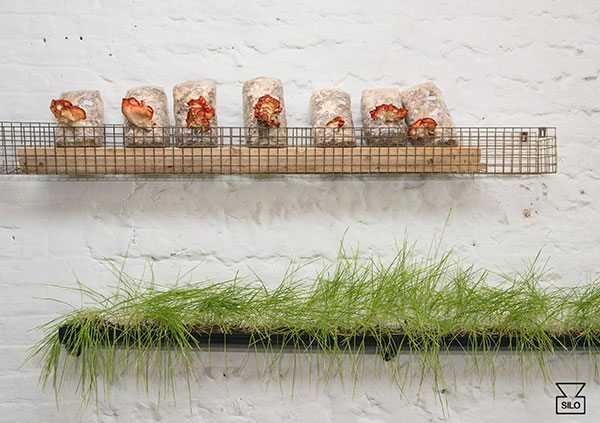 In a bid to counteract that he’s stripped everything back to the grass-roots, as it were, and he carefully selects ingredients that are as whole and natural as possible. In doing that he’s paying close attention to key note flavours, so there’s a simplicity and purity in the food that shows a gifted awareness of taste and texture combinations. 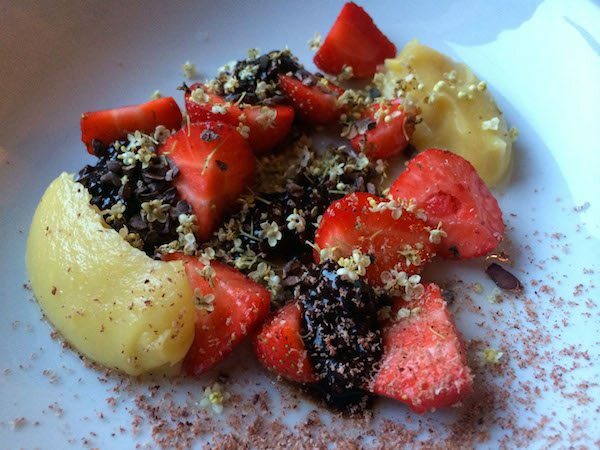 For our dessert we were presented with a plate of fresh strawberries with raw cacao in different ways – as a paste, grated and harder little nibs – lemon curd made just from lemon without any sugar and elderflowers adorning the dish as both decoration and for a more perfumed flavour. Again, this was a very summery, beautiful plate of food using ingredients that work well in symphony. For me personally the entire dish was a tad too sharp but that could be entirely a question of palate and taste – it’s hard to tell. All in all, it’s astonishing to eat an entire meal of such breadth, skill and vision with only one gripe but the standard at Silo is top notch. This is guilt-free dining with a very high pleasure count, so I for one am heartened and enlivened by Silo’s addition to Brighton’s restaurant scene. I’ve now eaten dinner there once and lunch twice and been happy on each occasion. I hear the breakfasts are fantastic too so that’s next on my agenda. Douglas needs to be saluted for what he’s doing – I hope his ideas spread like wildfire.